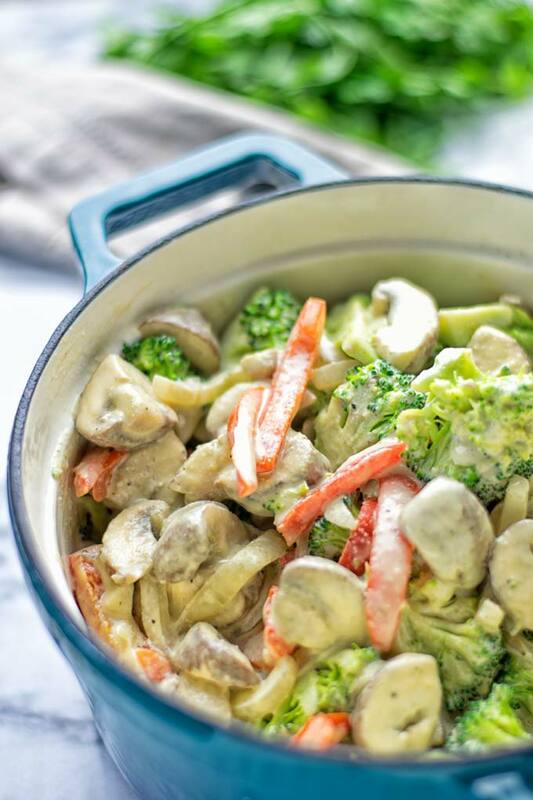 This Garlic Broccoli Stir Fry is an amazing one pot meal, super easy and naturally vegan gluten free. It’s packed with amazing flavors and super creamy. Plus you can make a fantastic oven version as well. So basically you have 2 recipes in one. One for the one pot version and one for the oven version. A winning combo that the whole family will love. 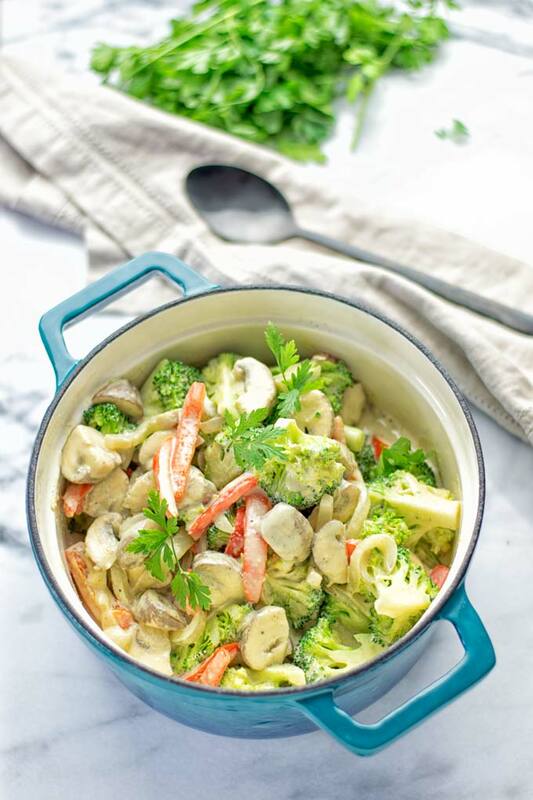 One Pot meals are always calling my name like with this Cashew Curry Broccoli Stir Fry or the Vegetarian White Chili. I find it so calming and relaxing what you can do with one pot meals. Just add everything to a pot wait until it’s done. 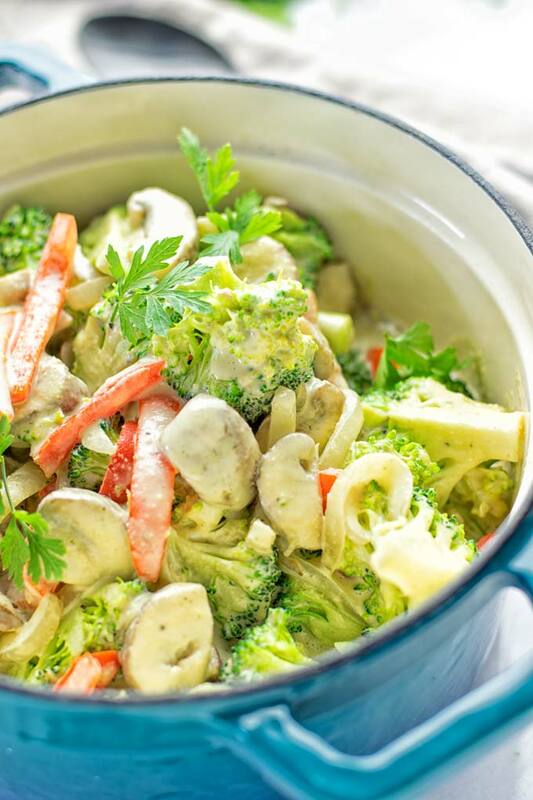 This Garlic Broccoli Stir Fry will impress and not disappoint you. It’s super creamy, addictive, fresh, satisfying, versatile, packed with mouthwatering flavors, low time invest and maximum flavor, hearty, savory, cheesy, comforting, and so delicious. What always play a part in the game is adding some veggies. You can add what you like: peas, asparagus, carrots, cauliflower, Brussels sprouts, plus more. We do something different. We don’t add fish, seafood or meat, which isn’t plant based. I used broccoli, carrots, mushrooms, bell pepper, and of course garlic. Veggies you might already have in the kitchen. 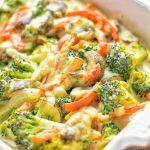 What you’re going to love about this Garlic Broccoli Stir Fry is the 3 ingredient vegan cheese sauce. It’s so easy to make. 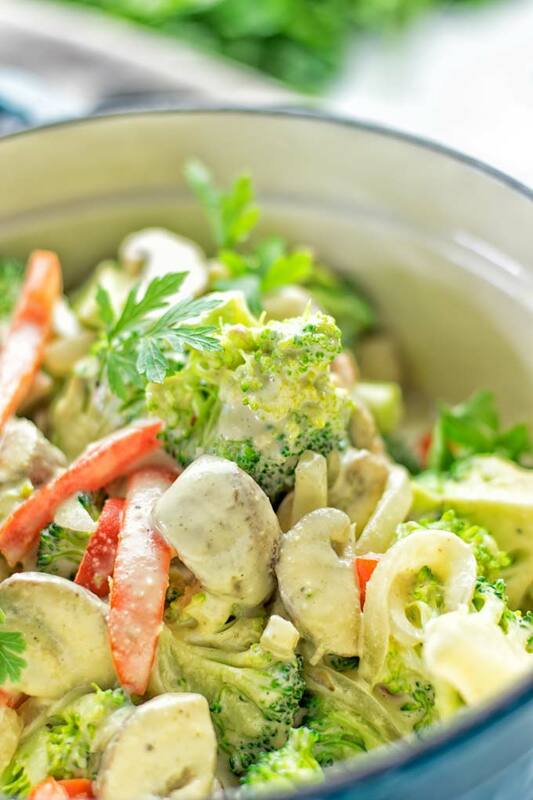 Just blend cashews, tahini, and vegetable broth in a blender until smooth and creamy, magic. It’s a great replacement to add richness and a really kind of dairy free cheese. You start with a pan or pot – you decide. Just use what you have in your kitchen. Now add a bit of oil, dairy free butter, or choose oil free with a bit of vegetable broth. Add onions, garlic and broccoli. Fry for around 4 minutes. Next add bell pepper. Let’s fry again for about 2 minutes. Add mushrooms and finish with frying for 2 minutes. 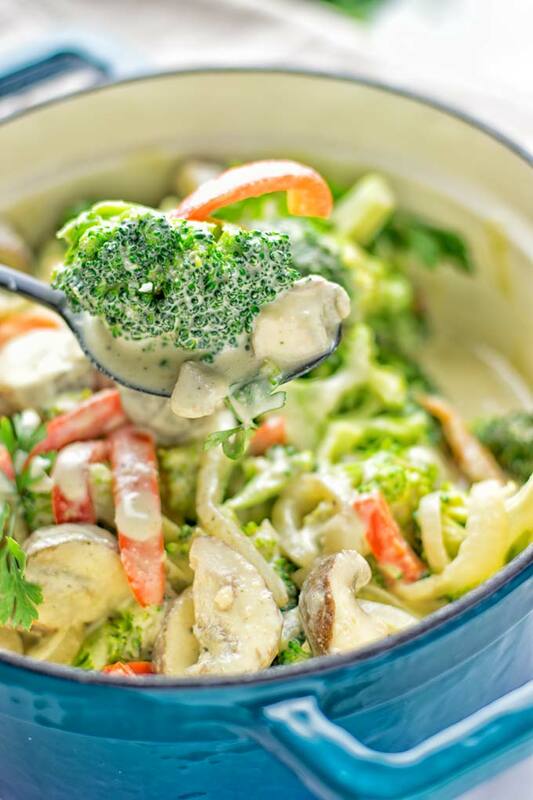 Last, add the prepared 3 ingredient vegan cheese sauce to your pan or pot and let simmer for 3 minutes. Mix everything together. Serve on plates or bowls. Only recently I tried something different with this fantastic Garlic Broccoli Stir Fry. I put it in the oven and it turned out so amazing, rich, creamy, and so full of bold flavors. You will need a 8×6 inch casserole dish for this. 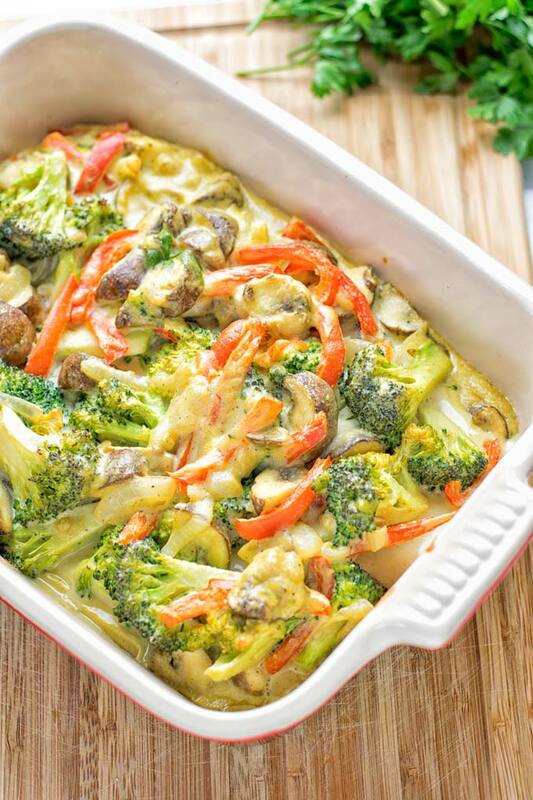 Just put all the ingredients like broccoli, onions, mushrooms, garlic and bell pepper in that casserole dish. 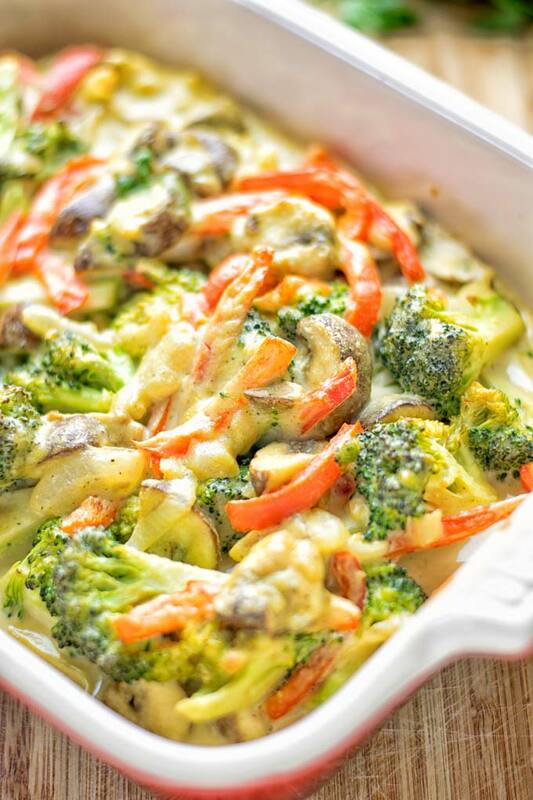 Mix with the 3 ingredient vegan cheese sauce and bake for around 20 minutes at 410°F. That’s all you need to do to make a oven version. I’m so curious if you try this which one is your favorite: the classic stove top version or the oven version. Please let me know. 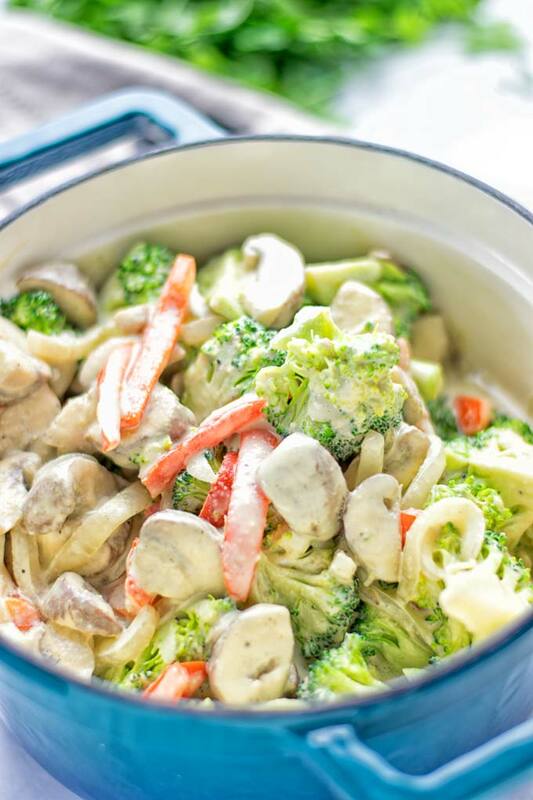 The Garlic Broccoli Stir Fry is delicious for lunch, dinner, meal preparation and work lunch. Also it can be a great and tasty appetizer or side dish, if you divide it into small portions. A seriously delicious and creamy dairy free alternative for everyone. No one will miss the cheese or meat, so creamy without any real cream or butter, magic. I made this dish for some friends, at our last movie night. Yup we do something regularly and change the places. Last time it was at my place. It’s like a potluck where everyone brings food or beverages. Everyone was impressed by this Garlic Broccoli Stir Fry. No matter if vegan, vegetarian or meat loving friends – it was truly satisfying and no one missed anything. I really find it’s delicious plain, but you can serve this with many sides, it’s so versatile. Sometimes I like my stir fry with a fresh baked slice of bread. Oh yes, so good from the oven like this Hummus Homemade Bread. Also it will taste great with some tortilla chips, over potatoes, quinoa, rice or pasta. There are many options for every taste and creativity. 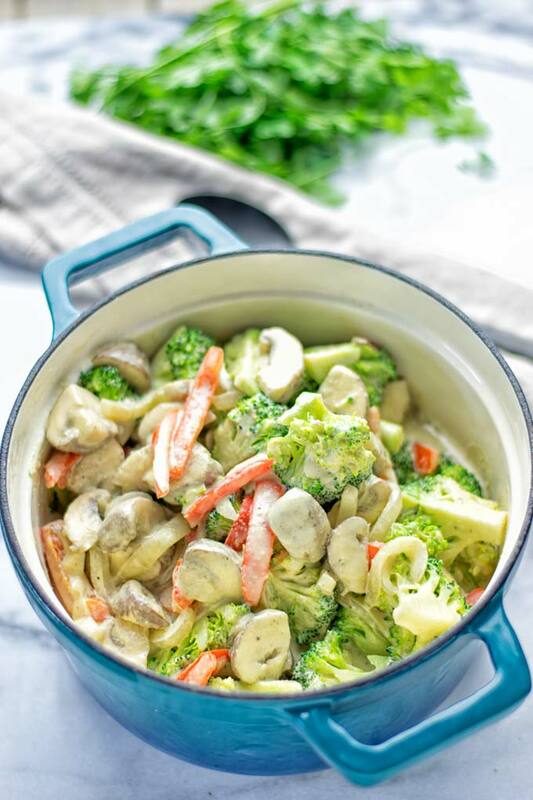 Try the Garlic Broccoli Stir Fry for yourself and share your feedback on Instagram or Facebook with me. I can’t wait to see all your amazing remakes. Enjoy and see you soon, Florian. You start with a pan or pot. Add a bit of oil, dairy free butter, or choose oil free with a bit of vegetable broth. Add onions, garlic and broccoli. Fry for around 4 minutes. Thank you for sharing another wonderful recipe. For the stove top version when do you add the broccoli? You seem to have left that out of the instructions. Thanks for the heads up, Denise! Fixed! You say you used carrots in your version but they’re not included in your recipe ingredients…..
Hi Jenniffer! I said” You can add what you like: peas, asparagus, carrots, cauliflower, Brussels sprouts, plus more”. These are only suggestions for you! Hope that clarifies and helps! Enjoy!